I’ve heard it time and time again: cheap Bordeaux just doesn’t exist. And if it does, it tastes like paint thinner mixed with marked gasoline. Bordeaux is home to some of the world’s most expensive wines, they say. There is very little value there, they shout. But I’m one of those people who says this whole “Bordeaux is a ripoff” thing is a bit of a myth. After all, there are more than 120,000 hectares under vine in the Bordeaux region, producing about 700 million bottles each year. That’s a lot. It would stand to reason, then, that a few bargains can be found from time to time. So I have a made it something of a mission of mine to find cheap Bordeaux that doesn’t taste like acetone. How hard can it be? I can buy a bottle of 15-year-old claret for just €8 at the Maison du Vin in Montagne, France, so why can’t I find something similar here? This week I found myself drinking something for £5.99 that was apparently rather savoury, was displaying great fruit and came complete with cedar notes. There was more to the blurb but most of the time I find wine labels rather forgettable and misleading, so I didn’t think to memorise it. 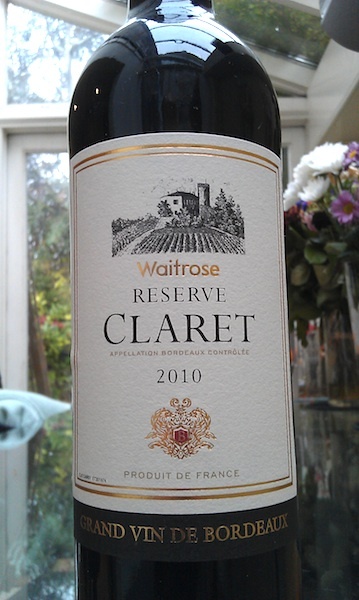 This is Waitrose’s Reserve Claret 2010 I’m talking about and, despite its already cheap price, is actually a step up from their most basic option, their Good Ordinary Claret, which sells for less than £5. For that money, it’s probably better than most wine you’ll ever find in a late-night off-licence, but how many late-night wine-drinking decisions are made during the day anyway? Anyway, a grand wine this was not, but that was always going to be obvious. But was it drinkable, was my main question? Sure, but it had some negatives. For a penny less than £6 the first thing I noticed when I opened the bottle was an overwhelming aroma of rubber. Thinking a bit of air would sort things out I left it in the glass and shifted over to the 18-year-old bottle of Chateau Potensac I’d been working on that weekend. The difference between the two, of course, was palpable. One had pedigree, age, class and complexity; the other had a supermarket’s name on the bottle, a clear misuse of the word ‘reserve’ on the label and not much of anything to show for it. Ah, except for price. At £5.99, it sells for about a quarter what the Chateau Potensac costs. For weekday drinking where you just want to get spannered, dump something neutral into a spaghetti sauce or maybe mull some wine, this wouldn’t be offensive at all. To give this poor wine credit where due, it has a lot going for it. It was drinkable for one. It was showing the right amount of fruit and, unlike some other cheap red wines I’ve had, it wasn’t so tannic that it was tight-as-a-rusted-nut. As I was buying this bottle during my weekly trip to the supermarket, I was reminded of other ‘value’ Bordeaux wines I’ve tried in the past. Front of mind was a 2009 sold by Virgin Wines under what they call a ‘cleanskin’ label. The marketing spiel made bold statements about its origins and how it was “the vintage of a lifetime” – all for just £7.50 a bottle. One sip of that wine told me that, under no circumstances, was it a fine example of a vintage of a lifetime, even if 2009 was a great year in Bordeaux. That brings me back to Waitrose’s Reserve Claret. For less than £6, what do we really expect from this wine, even if 2010 was a great vintage? I expect it to be drinkable, to be pleasant, to give me the confidence that I’ve not been duped. So, has this wine delivered? Yes and no. Yes insofar as it was a drinkable wine that didn’t really cause much offence, particularly after it was allowed to breathe so the funky burnt rubber smell would dissipate. No insofar as I couldn’t get over the burnt rubber smell in this wine. I know £6 is pushing the price/quality ratio a bit, but I’m sure it can be done.